Misanthrope Beechworth & The Dustwaste Wellspring Available Now! 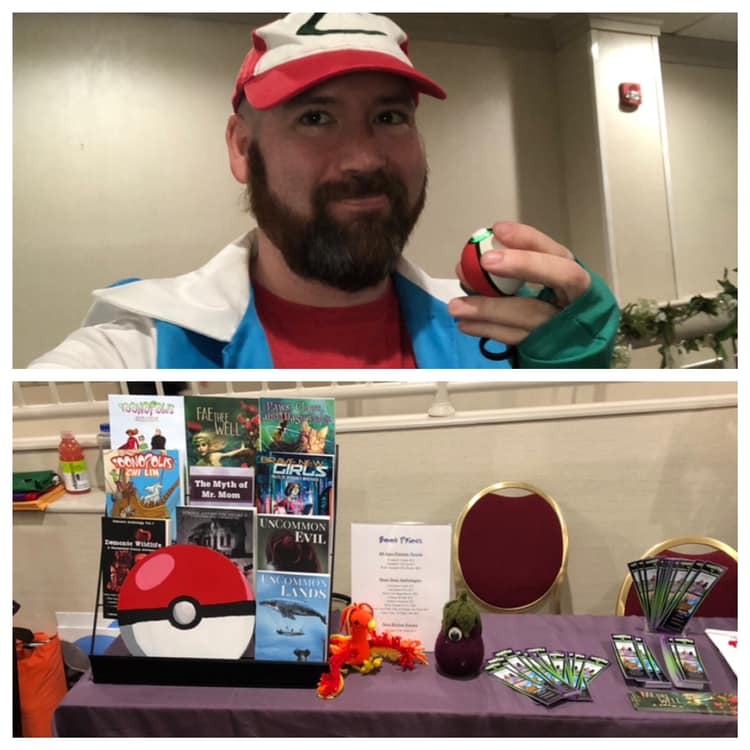 So this morning I woke up after a really fun weekend in Williamsburg, VA attending my first ever fantasy/scifi convention as an author: MarsCon 2019. Actually, it was my first one ever! After spending the first 7 years of my author career staying behind the keyboard, I started getting out last year for the first time. Last day at MarsCon, dressed in my “all growed up” Ash Ketchum costume! Coincidentally, the reason I was at MarsCon this year in the first place was because I was encouraged to attend by the wonderful Tara Moeller of DreamPunk Press, whom I met in Norfolk at the Slover Library Local Author Fair in March of 2018 (my first “fair” as an author). In addition to telling me about MarsCon, she also invited me to submit to the fae-themed anthology she was publishing specifically as a charity anthology *for* the con. Fae Thee Well was the result and includes my “Tiny Brown Hands” Shoemaker & the Elves retelling set in a modern-day Indonesian shoe factory. It’s a beautiful charity anthology full of fae-themed short stories and poems and proceeds from the book went to the Heritage Humane Society. 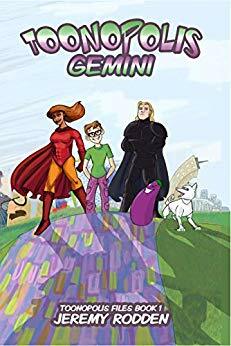 It was released this weekend at MarsCon but is available to order through DreamPunk Press here! After a short day on Friday (I set up my table but went back to Norfolk for a date night with my wife to see Trevor Noah, which was awesome), I got into gear on Saturday full swing! I met some amazing people, had some awesome geeky chats with folks, sold some books, exchanged some business cards, and had a blast with my table neighbors! On my left, a talented pair of artists from NeverBen Designs who were super chill. And on my right, the inestimable Mo “Mxknowitall” Moeller (who is the child of the aforementioned Tara and someone I was lucky to befriend last year). On top of this, I met and had great conversations with some other wonderful authors like epic fantasy author Katika Schneider (with whom I did a book trade and am looking forward to reading the first book of her Afflicted Saga!) and scifi author Drew Avera (who, despite being friends on Facebook for nearly a year and living 15 minutes from one another, I never met in person before this weekend). 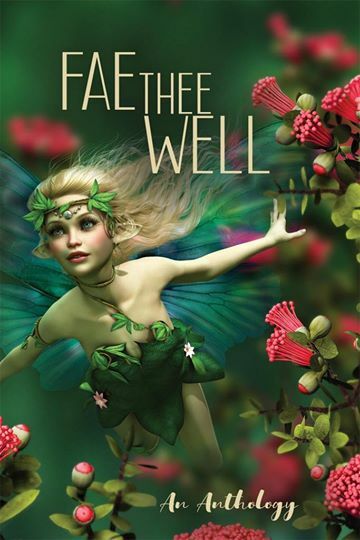 Andrew Hiller, a fellow contributor to Fae The Well, was a delight to listen to with his wonderful storytelling ability and life experience. On Sunday, I participated in my first panel as an author (with Tara and Mo, who is trans) called “Forget The Glass Slipper,” where we discussed raising a child without traditional gender roles and had a very lively and positive chat with the attendees. Not surprising my first panel was more for my experience as a father than as an author but I’ll take it! I’ve made new friends, new colleagues, discussed some possible future projects (I’m super excited about a few of them), sold some books, and just loved the positive energy of the event. 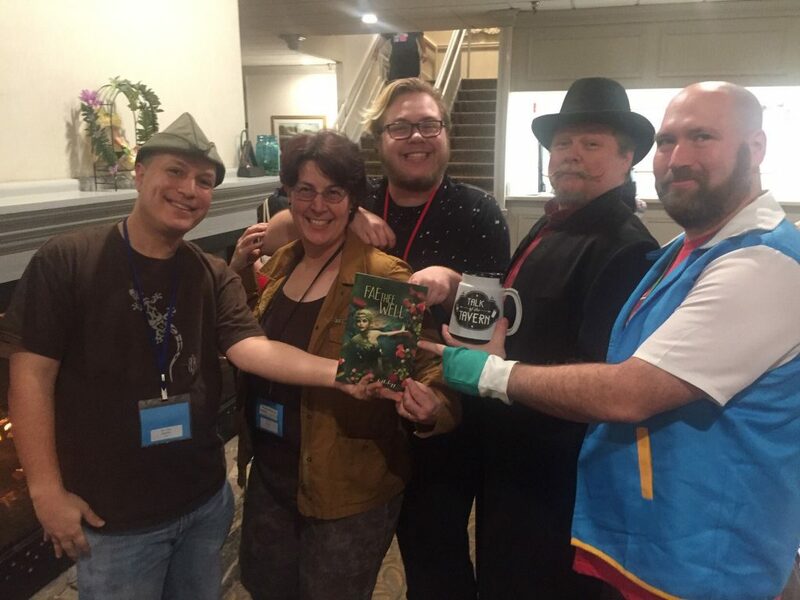 Left to Right: Andrew Hiller (hilarious storyteller/author), Tara Moeller (my new BFF), Mo Moeller (my other new BFF), Travis Sivart (the man with a sharp mustache and even sharper wit), and myself! All in all, I am super happy and energized by my weekend. I’m simultaneously tired and need a nap, but MarsCon was a most wonderful experience for a con rookie like myself and I can’t wait to do more… especially MarsCon 2020, where I understand the theme will be Rogues and Rebels and expect to see some serious pirate action! If you’re in the general area of Hampton Roads and wanna find me and chat in person, keep an eye on my Facebook Events page for where I’ll be next! I am an overeducated stay-at-home dad to two wonderful sons. I have a BA in Religion and English Writing and an MA in Education. I worked briefly as a high school English teacher before we opted to keep me home when my second son was born in 2010. As a writer, I consider C.S. Lewis, Lewis Carroll, Douglas Adams, and Neil Gaiman my strongest influences. I enjoy multi-layered plots, clever wordplay, and bad jokes.